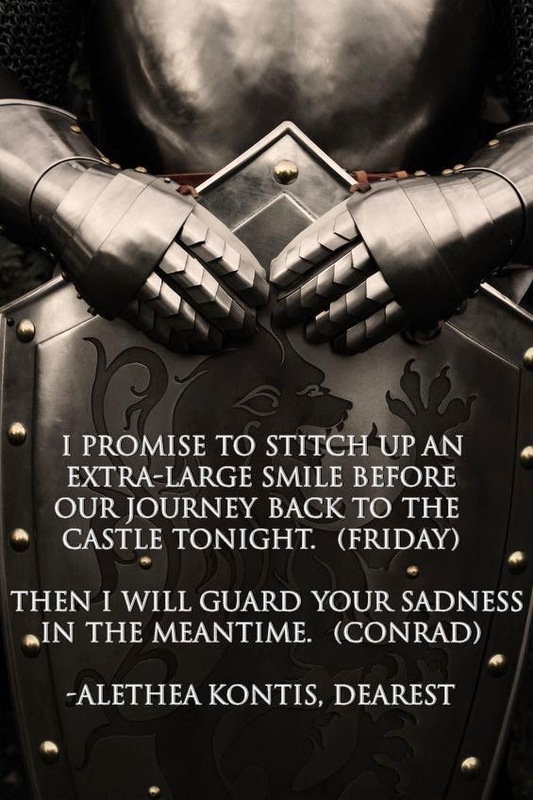 Did you miss any of the magical posts and reviews for this tour? Go check them out now! 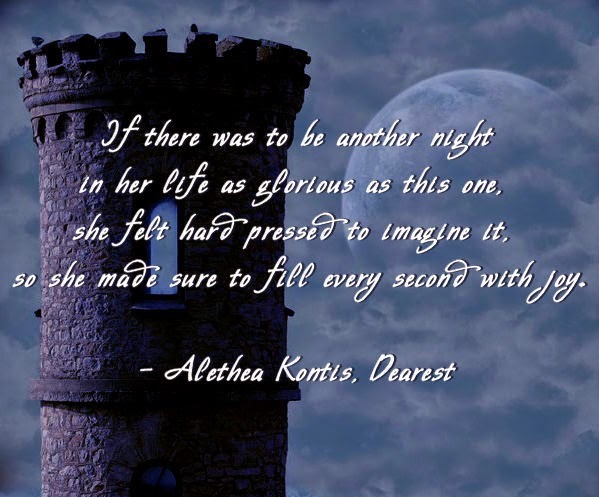 You can also grab the 20th Chapter of Dearest, not previously released, on Amazon and Barnes and Noble. I love Friday—I think she’s my favorite of the sisters so far mainly because she’s so sweet and kind—and Tristan is also very likeable but it’s the seven brothers as a group who make this tale so much fun. But when it came to fantasy films, we had what we lovingly referred to as “The Holy L Trinity”: Legend, Labyrinth, and Ladyhawke. It was rare that we watched one without immediately watching the other two. It didn’t matter which order, just as long as they all got seen. Highly recommended. 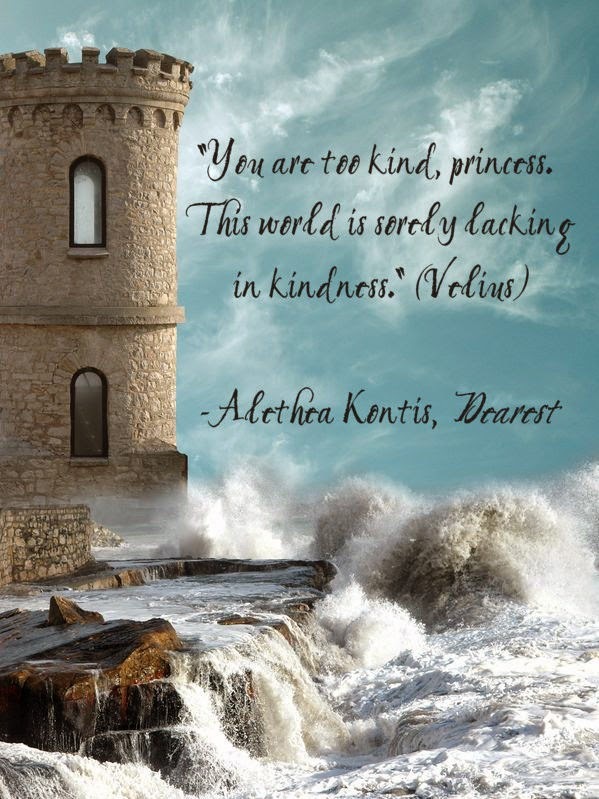 If you love fairy tales, you will love this series. Even if you are among the majority who only know Disney’s version of events, you will love this series. 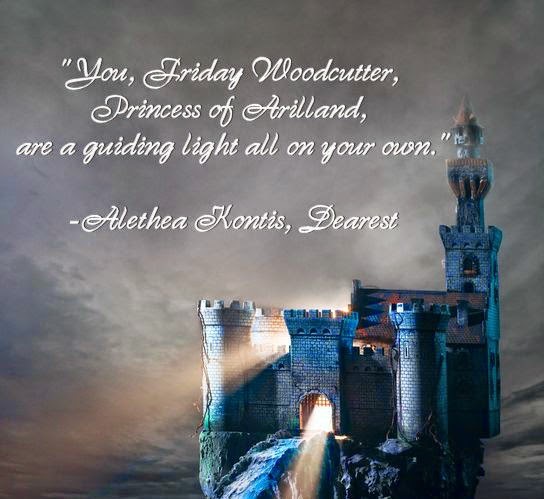 Don’t be scared off by the mutual affection Kontis and I have for Grimm, b/c while, YES, the details stay true to their European roots, the Woodcutter sisters always live happily ever after. 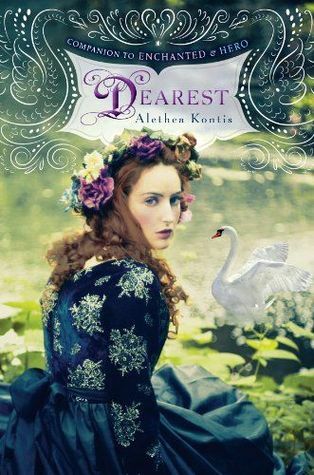 Dearest was a sweet romance and a fantastic mix of some of my favorite fairytales. “The Seven Swans” and “The Goose Girl” were but two of them. I loved the way the stories were once again intermingled in new and intriguing ways. 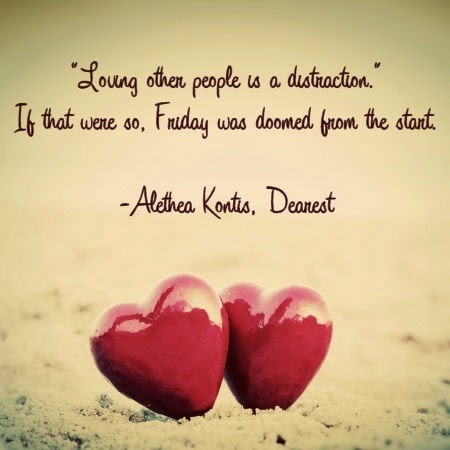 Friday’s love story was one worth reading again. 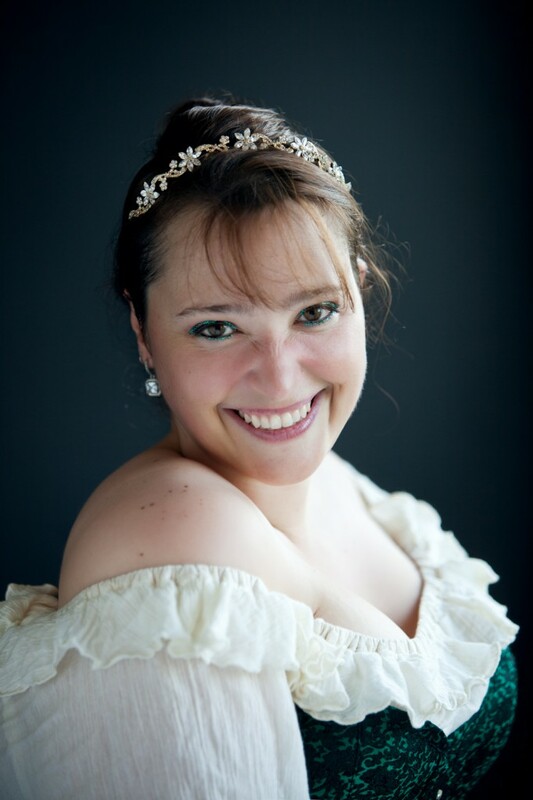 Dearest is based in part on “The Wild Swans” by Hans Christian Andersen and “The Goose Girl” by the Brothers Grimm. 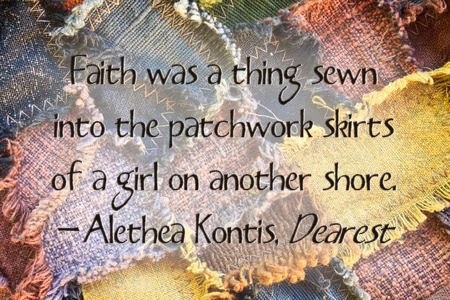 How are both of these tales referenced in Dearest? This year I will be publishing Diary of a Mad Scientist Garden Gnome(another illustrated collaboration with Janet K. Lee), Trixter (a Woodcutter novella), and a trilogy of short contemporary romance novels set in a small beach town in central Florida. I’m very excited about all of them! One of my favorite parts of a book is the dedication. Before the interwebs, a dedication—because there wasn’t always an acknowledgements section or author’s note, especially in fiction—was the closest a reader came to knowing the author as a person. I always start each one of the Woodcutter Sisters books with a “base note” fairy tale (like a base note in perfume). 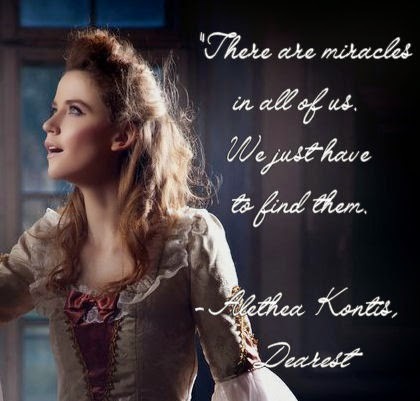 The base note for Dearest was “The Wild Swans” (aka “The Six Swans”). But I can’t think of fine-feathered fairy tales without thinking of my personal favorite, “The Goose Girl”…so I had to add that too. From there, the rest just sort of fell into place. 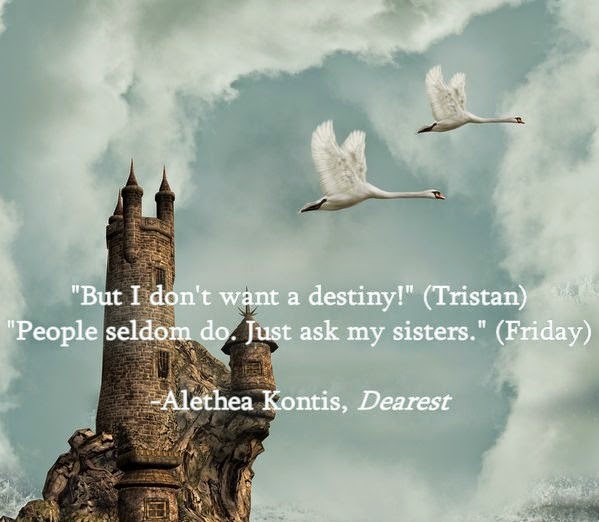 When I began writing Dearest, I knew I wanted to incorporate “The Goose Girl” and “The Wild Swans” and “The Six Swans” and every other fairy tale that involves a gaggle of men who are cursed into birds. . . . 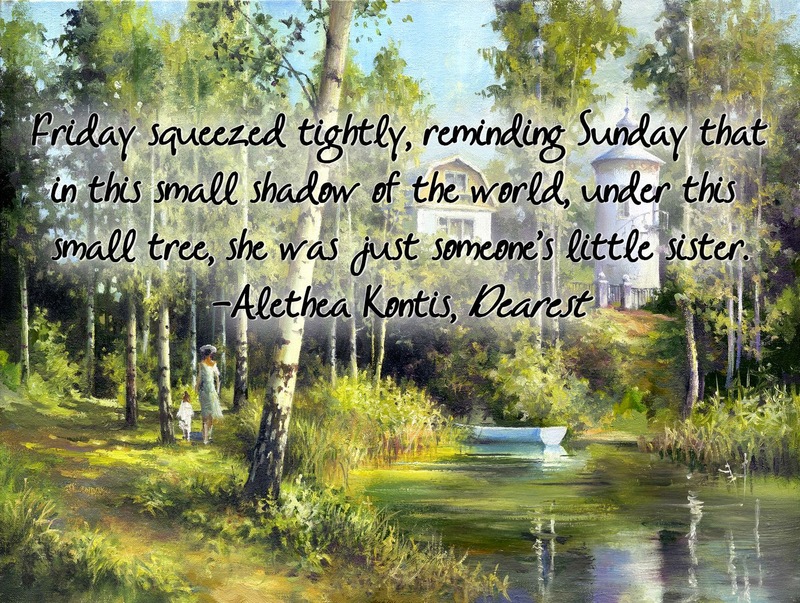 This was my favorite book in the series so far and not just because I rec’d an early review copy that Alethea signed and doodled, although… I 5-star love that, too. Mostly 5 stars because this story makes me want to know and remember ALL the stories, which is crazy and not even possible because they haven’t all been written, yet! As many writers—and children in Deep-Doodoo Trouble—know, the best stories are often an amalgamation of more than one thing. One idea comes to mind that sparks a myriad of other ideas…some you might have had a very long time ago, and some you might have imagined only yesterday. . . . The seven Swan Brothers of Dearest were a story born of three such singular ideas. I do! I don’t have a lot of time to do so anymore–and I often hear that reviewers are sometime freaked out when the author pops by unannounced–but I do have Google Alerts and Twitter searches saved with my name. 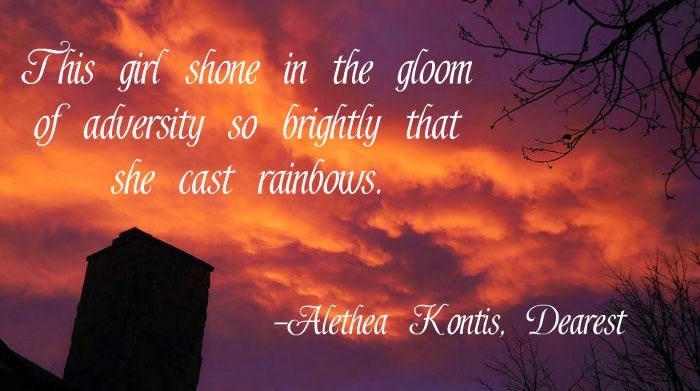 (It’s nice to be the only Alethea Kontis on the planet!) I appreciate every reader who takes the time to write a review. I used to be a book reviewer, both in print and online–I know how much extra energy it takes to put those thoughts into useful words. I really enjoyed this story though because it was everything I wanted to know and more about what was happening in Arilland while Saturday was adventuring as a pirate (which was my favorite part about Hero) and this book gave me that and more by the time I finished it. I can’t wait to see which sister is next in the series! So I thought that the plot was really good. Friday is an awesome chick that I just wish I could be. I mean who doesn’t want to be able to save a couple of hot twins from turning into swans each day. Not to mention, the girl gets to do the saving in this story, NOT the guy.